The building suffered severe damage after it was attacked during Storm Emma in March. LIDL HAS ANNOUNCED that it will reopen its Fortunestown Lane store in Tallaght by the end of August after the building suffered severe damage during Storm Emma in March. The staff that were redeployed to other stores in the west Dublin area following the incident will return to work there on 30 August. A number of garda units were deployed to the premises on 2 March following reports of burglary and thefts of vehicles in the Fortunestown Lane area of Tallaght. Substantial damage was caused to the supermarket and further damage to another premises nearby. Eight men between the ages of 24 and 47 have been charged with various offences including theft, burglary and trespassing, arising from the incident. In a statement released today, Lidl confirmed that the Fortunestown Lane store will be “new and improved”. The retailer also said that floor space in the store had increased and the number of car parking facilities had almost doubled. 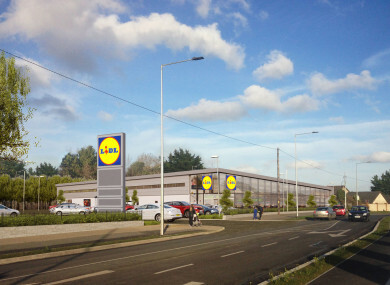 In February 2017, Lidl had applied to South Dublin County Council for planning permission for the redevelopment the store. The application proposed the demolition of the existing single-storey building in order to make way for the construction of a two-storey mono-pitch licenced food store. It also proposed the redevelopment and extension of the existing car park to provide an extra 145 car parking spaces. Email “Lidl store that was destroyed during Storm Emma to reopen next month”. Feedback on “Lidl store that was destroyed during Storm Emma to reopen next month”.